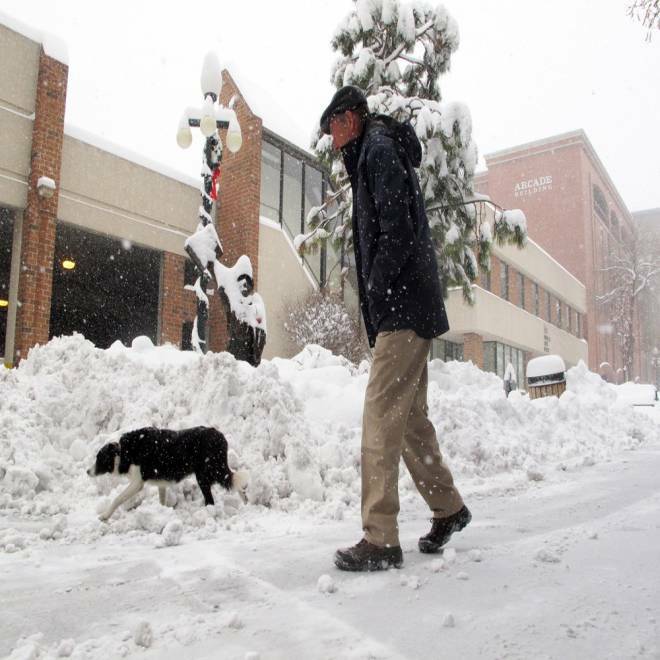 A man walks his dog past a half-buried statue of a newspaper boy in Helena, Montana, Friday. A winter storm dumped up to 4 feet of snow on parts of Montana and was expected to create severe thunderstorms as it heads east, Weather.com reported early Saturday. A strong jet stream was bringing moisture from the Pacific into the western U.S., while cold air pushed in from Canada, Nick Wiltgen of Weather.com said. He expected light snow would continue Saturday for much of Montana, though the winds had diminished in the western half of the state. Wiltgen added that there had even been some lake-effect snow in western Nevada, south and southeast of Lake Tahoe and Pyramid Lake. “Beware of this in the Reno and Carson City areas,” he said. “Utah and western Colorado are in line for the more widespread snows, with winter storm warnings in effect for most mountain ranges in those areas,” he added, predicting a “bonanza” for ski resorts across the region.